Bayonetta might be the guiltiest of guilty pleasures, but I’ll be damned if it isn’t a great one. Let me be blunt; Bayonetta is everything I have ever wanted from an action-adventure game. This week marks its return to the Playstation Network, and I just can’t bring myself to write about anything else coming out with Bayonetta on the table. It was originally released on the PS3 and Xbox January 5th in 2010, but I’ve thrown it back in countless times since then, and if everything goes according to plan, I will again in the future (more on that later). With its multiple risk versus reward systems, inventive weapon and level designs, and its relentless assault of otherworldly creations, its hard to come up with a reason to dismiss it at a 20$ price point. If you’ve ever played a Devil May Cry game, you’ll have a good groundwork for what to expect from Bayonetta (mechanically, anyway). You’ll be knocking enemies into the air with melee weapons, shooting them, jumping around, and trying to keep your combo alive while avoiding getting wailed on yourself. Like I said, its only a good groundwork though. While Devil May Cry allowed you to wield one melee weapon and one ranged weapon, Bayonetta is content to let you wield whatever weapon wherever the hell you want. Guns on your feet? Great! Go for it! Actually, why resort to guns when you could have rocket launchers on there? In fact, stick rocket launchers on your hands AND feet! There’s a smorgasbord of options open, and you can swap between two weapon setups at any time, linking combos between them. How many guns can you use? I don’t know, how many limbs do you have? There are a few exceptions. You can’t wield the ice skates on your hands, for example (a matter of great disappointment for me, I’ll have you know), but its still some of the most variety I’ve seen in a game of this genre. There’s a brevity of other options outside of just your arsenal as well. One major improvement over the Devil May Cry series (sans the most recent) is a button dedicated to dodging, so the jump button is no longer intrinsically tied to your dodge command. With timely dodges that narrowly avoid danger, you’ll even be rewarded with something called Witch Time, which slows the world down and allows you to land a few risk-free blows. 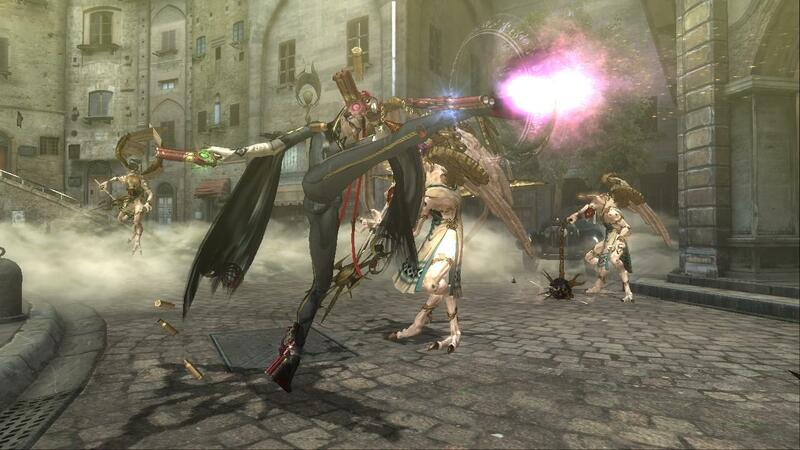 Bayonetta also has the ability to transform into an assortment of creatures, including a panther and a crow. Their use is mostly limited to a handful of scenes, but the option to transform is always there. By the way, some of the music in Bayonetta is just as out of control as the game. Did you ever think “Fly me to the Moon” by Frank Sinatra might sound better if he were born in Japan? Oh, and female? Then Bayonetta has your back! The song somehow fits perfectly with the theme of the game, and I could easily picture her singing along to it while murdering angels. There’s also a very catchy After Burner: Climax cover much later, complete with a subtle vocal background track that’s easy to miss if you aren’t listening for it. The level and character design in Bayonetta is among the most memorable I’ve seen. There’s a great sense of escalation, as each level becomes more and more bizarre.The first few areas are grounded in reality, with an aesthetic reminiscent of old eastern european cities. It won’t be long though before the city streets become connected by gold ribbons, or break into giant pieces you’ll need to hop across to traverse a celestial void. 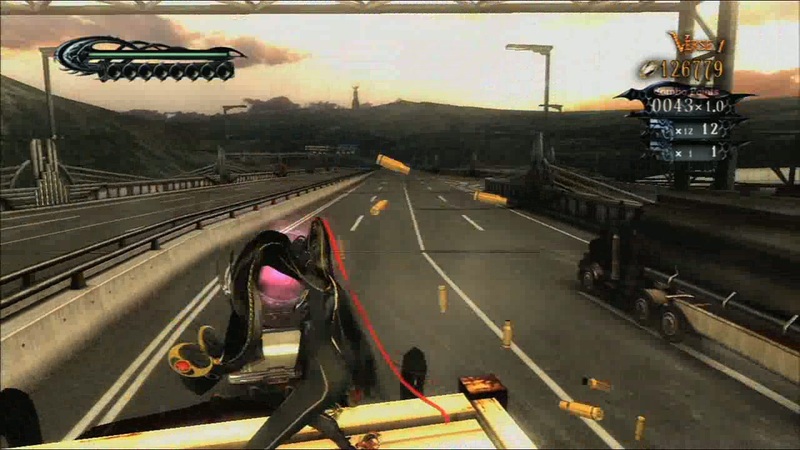 Later the game abandons any pretense of reality at all, especially during the major boss fights. One moment involves surfing on a piece of metal while fighting a battleship with legs. Why does it need legs in the water? Why does it have eyes and a brain? Who cares? Kill it! There’s a variety of “torture attacks” in the game. Yes, that is a guillotine. My favorite thing about Bayonetta is the way it handles difficulty. The game demands perfect timing and execution from you in order to tackle everything it has to offer. On higher difficulties, Bayonetta won’t just increase the amount of damage you take, or the amount of hits a boss can take before it dies. Instead the enemies fought in each stage will change, either in number or type, creating new challenges in every chapter. Even the most basic levels on harder difficulties will require apt attention to conquer. The final difficulty raises the bar even more by taking away Witch Time, a key mechanic you’ve been taught to rely on throughout the entire game. Imagine if you started Star Fox 64 on hard and were told you couldn’t use the lock-on function anymore, and the experience would be comparable. This level plays a variation of the OutRun! theme. Another one later plays a fantastic version of the Afterburner: Climax song. Oh, also you’re riding a missile while it plays. The end result is a formula that keeps me returning for more. The quirky atmosphere won me over from the start, and the depth of skill required to tackle the hardest difficulties keeps me pressing forward a little more every couple months. A final (and somewhat ironic) word of caution; the PS3 version of Bayonetta has some slight problems. Loading times are curiously long and the frame rate sputters on occasion. If given a choice between consoles, the 360 version might be the better alternative. But for 20$, the PS3 version is still a fine way get everything you could want out of Bayonetta.